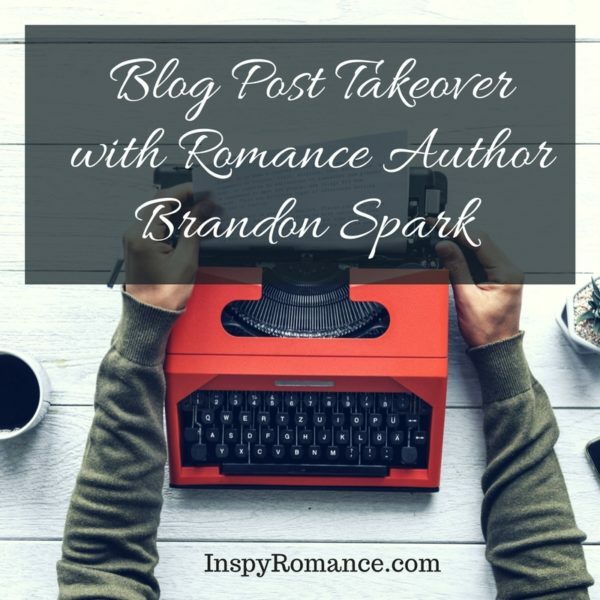 Hi there, Brandon Spark here! I’m a contemporary romance author who, in case you were wondering, is not related to a certain author of a similar name. I’m also not real, not in the living and breathing sense of the word. Before I confuse you anymore, let me tell you that I jumped from my creator’s brain to take over her blog post today. Yes, I’m a fictional character who lives and breathes inside Liwen Y. Ho’s imagination—and what an interesting and crammed place it is. I see many doors in here with names on them. There’s one with mine on it, but unfortunately, it’s locked. I’m guessing Liwen is still working on my story and isn’t ready for me to peek inside yet. I get it though; I’m an author myself, and know how tricky plotting can be. Since I can’t talk about my story with you today, I thought I’d tell you about my brother Aiden’s. Let me give you a little background on my family. We have two loving parents who brought us up in a stable and warm Christian home. There are five of us boys: Aiden, myself, Colin, Darren, and Evan. My mom was an elementary teacher who taught the ABC’s all day long, so when it came time to name us, she did it the only way she knew how—alphabetically. Even though we all had a pretty great childhood, life hit Aiden hard when he was a teenager. Long story short, he lost his first love to cancer. This was also around the time his boy band career was taking off. Oh yeah, I forgot to mention Aiden’s a bit of a celebrity. He’s always thrived in the spotlight, both in the past as a pop singer and now as a college professor. Yeah, it’s a bit of an understatement to say the ladies love him. Even though singing was his passion, he gave it up when Mandy passed away. He almost gave up on God, too. But God never gave up on him. My brothers and I didn’t either. We’d been praying for him for a decade and waiting for him to pull through his grief. That’s when Abby came into the picture. The first time I met her, I’ll admit she scared me a little. (I get shy around women in general though.) Over time, however, I discovered how well she complements Aiden and how much she loves the guy. Like really loves him. And he loves her. Sure, they had to figure out a lot of things before they got to this point, but they’re proof that love conquers all. That might sound cheesy, but hey, I’m a romance author, I can say cheesy things. 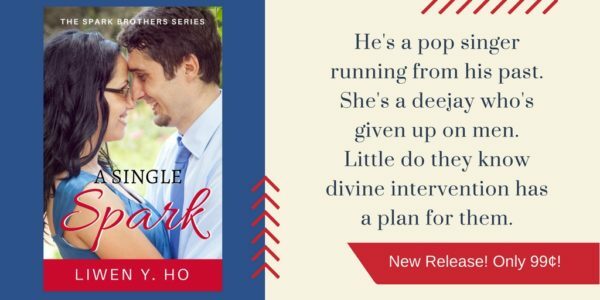 As a lover of all things romance, I highly encourage you to check out Aiden and Abby’s story in A Single Spark. All the Spark brothers make an appearance in this book, so you’ll get a glimpse into our different personalities and lives. After you read the story, maybe you can help me figure out who I’ll end up with. Do you agree with him that love conquers all? What are your favorite quotes about love? Please share them in the comments below! Hi Liwen, fun interview. I enjoyed Abby and Aiden’s story. I do think love conquers all, but I also think that love means doing hard things. Hi Wemble! I’ll let Brandon know you enjoyed his blog post. ;) Yes, I totally agree that loving someone is hard work! (But it’s so worth it. ) Thanks for reading and commenting! Hi Liwen! Delightful interview. Love conquers all, but the outcome may not always be what we expect. Best wishes and happy writing. Hi Renate! I’m glad you enjoyed the interview. :) You make a great point; real life doesn’t always work out the way we wish. But it’s comforting to know God is wiser than us and knows exactly what is best for us. Thanks for reading and commenting! Yes, love does conquer all. After all, God is love. I very much enjoyed Aiden and Abby’s story. I’m looking forward to reading the other Spark books. Hi Sherri! That’s a great way to sum it up. :) God’s love does conquer all. Thanks so much for reading A Single Spark! There’s a lot of hard work involved in love and love conquering all. My small group is doing a series on godly marriage and it’s clear that love and dedicated commitment go hand in hand. I loved Aiden and Abby’s story and can’t wait to enter Brandon’s world. Hi there! That sounds like a good study. I totally agree that real marriage and relationships take a lot more work than fictional ones. ;) So glad you enjoyed A Single Spark. I’m excited about Brandon’s story, too. Love is patient and kind not proud but gentle and meek. 1 Corinthians 13 is the best definition of love. God’s love really does conquer anything! Hi Diana! That’s one of my favorite passages. I’m so thankful we have the ultimate example of love in Jesus. <3 Thanks for reading and commenting! What a fun post! I need to read this book. :) I not sure love conquers all or not. I’m thinking not. You can love someone and still have an unhealthy, dysfunctional, or abusive relationship–it doesn’t change the problem. So… maybe it doesn’t conquer all (just thinking “out loud.”) It’s food for thought for sure. Hi Kimberly! Those are tough issues you bring up, and real life doesn’t always get a HEA like in the stories we read and write. I suppose it’s safe to say that only God’s love can conquer all. Thanks for sharing your thoughts. I hope you enjoy A Single Spark! Sounds like a good book. I just downloaded it. Hi Liwen–Loved this interview. And yes, I agree…love conquers all. :) Thanks for sharing your character Brandon yet. He knows who he is for sure….The series sounds great. Off to purchase my copy! Hi Lindi! :) Thanks so much for your enthusiasm and support! I hope you enjoy A Single Spark! wow, this really sounds like fun! I absolutely loved the book and the family! Aww, it was fun to write, and I hope fun for readers as well! Thanks for reading and commenting, Paula! Great blog! Now quit wasting time and write Brandon a story! I love the post. I different take to the usual blog. Love is kind….and truly Love conquers all. Hi Colleen! So glad you enjoyed it. I thought it’d be fun to let one of my characters do the talking. :) And yes, love conquers all. Thanks for reading and commenting! Hi Liwen, lovely post :) It was fun to meet Brandon.